Blockade runners were not warships; with no means of defense, if cornered they almost always surrendered without a fight. One exception was the Laird-built paddle steamer Lark, which made four successful round trips through the blockade between Galveston and Havana. On one run into Galveston, possibly in early April, Lark went aground near the harbor entrance and was attacked by boats from the Federal blockading squadron. 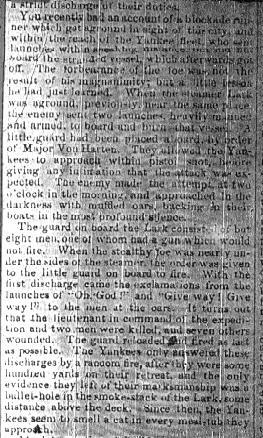 As related below, Lark's crew, assisted by Confederate troops, successfully drove off the attack, a rare event in the history of blockade running. On her last run she slipped into Galveston before dawn on May 24, the same morning Denbigh was burned. When she arrived at the wharf, she was overrun and stripped by civilians. She picked up Denbigh's crew and dashed out to sea again, the very last blockade runner to clear a Confederate port. You recently had an account of a blockade runner which got aground in sight of this city, and within the reach of the Yankee fleet, who sent launches within speaking distance but did not board the stranded vessel, which afterwards got off. The forbearance of the foe was not the result of his magnanimity; but a little lesson he had just learned. When the steamer Lark was aground, previously, near the same place, the enemy sent two launches, heavily manned and armed, to board and burn that vessel. A little guard had been placed aboard by order of Major Von Harten. They allowed the Yankees to approach within pistol shot, before giving any intimation that the attack was expected. The enemy made the attempt, at two o'clock in the morning, and approached in the darkness with muffled oars, backing in their boats in the most profound silence. The guard on board the Lark consisted of but eight men, one of whom had a gun which would not fire. When the stealthy foe was nearly under the sides of the steamer, the order -was given to the little guard on board to fire. With the first discharge came the exclamations from the launches of "Oh, God!" and "Give way! Give way!" to the men at the oars. It turns out that the lieutenant in command of the expedition and two men were killed, and seven others wounded. The guard reloaded and fired as fast as possible. The Yankees only answered these discharges by random fire, after they were some hundred yards on their retreat, and the only evidence they left of their marksmanship was a bullethole in the smoke-stack of the Lark, some distance above the deck. Since then, the Yankees seem to smell a cat in every meal-tub they approach. Thanks to Valerie Buford of Galveston, Texas. Monday, July 03, 2000 Revision.